As suggested by the name, whey protein is a type of protein found in whey, a by-product of the cheese-making process. While the Mayo Clinic notes that whey protein does provide some benefits, it is not without its risks. Individuals who are thinking about adding this protein to their diet should be sure to familiarize themselves with the possible risks before incorporating it into their meal plans. According to the Mayo Clinic, whey protein is likely safe for healthy adults as long as it is used only in the amounts recommended by manufacturers. In fact, individuals who consume no more than 30 grams of whey protein by mouth each day for up to six months should face no significant health consequences, notes the Mayo Clinic. Similarly, the Mayo Clinic reports that taking one single dose of whey protein in amounts up to 50 grams is unlikely to result in adverse events. 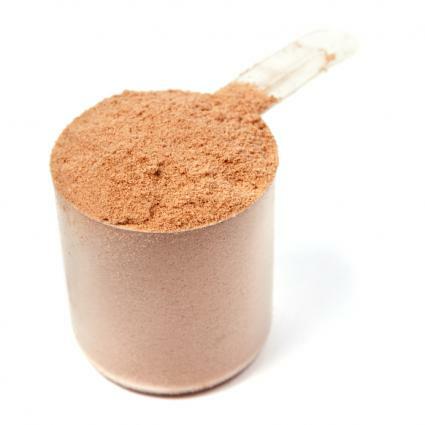 While whey protein appears to be safe when used in limited amounts, those who exceed intake recommendations - or take the supplement for longer than six months - may develop serious health complications. In Nutrition Therapy and Pathophysiology, Marcia Nelms, Kathryn Sucher and Sara Long Roth report that excessive whey protein intake may be especially dangerous for those who suffer from certain types of heart disease, as it may result in the development of abnormal heart rhythms and possible cardiac arrest or the complete loss of heart function. Nelms, Sucher and Roth also note that taking whey protein in excess or for longer than six months can be damaging to kidney and liver health. They further caution that long-term, excessive damage to the kidneys and liver may necessitate the need for organ transplantation or kidney dialysis. Individuals who are interested in supplementing their diet with whey protein can likely do so safely as long as they do not exceed recommendations for daily intake or length of use, notes the Mayo Clinic. Nelms, Sucher and Roth warn that those who ignore these recommendations put themselves at serious risk for various health consequences, including heart arrhythmias and liver and kidney disease.